Jonathan Seitz. 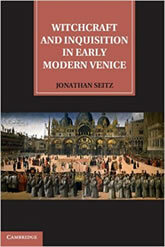 Witchcraft and Inquisition in Early Modern Venice. Cambridge University Press, 2011. In early modern Europe, ideas about nature, God, demons, and occult forces were inextricably connected and much ink and blood was spilled in arguments over the characteristics and boundaries of nature and the supernatural. Seitz uses records of Inquisition witchcraft trials in Venice to uncover how individuals across society, from servants to aristocrats, understood these two fundamental categories. Others have examined this issue from the points of view of religious history, the history of science and medicine, or the history of witchcraft alone, but this work brings these sub-fields together to illuminate comprehensively the complex forces shaping early modern beliefs.